When you’re sitting in the Caribbean sipping your Rum and Coke or Pina Colada you really don’t expect to be thinking about how a snow storm is going to affect your vacation. That is until you remember your return flight or flight taking to the Dominican Republic takes you through New York. As of noon today (Friday the 8th of Feb) over 3000 flights were canceled around the New York and Boston areas (over 1000 in New York Alone) with more than 60 airports already affected. And at this point the storm has just begun. This affects all flights going to New York from Santo Domingo, Punta Cana, La Romana, Santiago, and Puerto Plata. The main snowfall from winter storm Nemo is expected to come in the late afternoon to early evening and things are expected to taper off by noon Saturday. My wife and I were sitting in the airport in New York this morning hoping our flight was going to make it out before the winter storm Nemo hit. As we watched the snow starting to fall many of our fellow passengers were starting to get anxious. By 7am in the morning airport employees were starting to mention the possibilities of delays and cancellations of flight within the next new hours. The Dominican Republic is one of the most important Caribbean islands and one of the preferred holiday destinations for many UK holidaymakers. According to the Dominican authorities, more than 200,000 British tourists visit this Caribbean nation each year, and it is not difficult to understand why. Although relatively small in size, this island offers a variety of attractions that go beyond its beaches and nightlife. The Dominican Republic is home to no less than 14 national parks and to numerous historical towns and villages that will delight the visitor with their rich heritage. The island’s capital, Santo Domingo, is a designated UNESCO site thanks to its well preserved examples of colonial architecture. There are 26 golf courses located in some of the island’s most stunning locations, and as a result, the Dominican Republic is a premier destination for golf enthusiasts from all over the world. And of course, there is the beach life. The coastal towns of Puerto Plata, Punta Cana, and La Romana are home to miles of beaches of breathtaking beauty, which are often the backdrop for weddings, honeymoons, and other special occasions. The popular resorts of the coast also make for a great base from which it is possible to explore other destinations, like the coffee growing mountains of the interior and other less well-known fishing villages on the island’s eastern coast. However, being 9 hours away from the United Kingdom, the Dominican Republic still remains a long haul destination, and as such, booking a holiday to this Caribbean island can be an expense that turns out heavy on the pocket. If you are planning the holiday of a lifetime in the Dominican Republic and want to know how to go about finding the best deals to the island, this article will tell you everything there is to know about it. No doubt while on a Dominican beach you are going to want some snacks and cold drinks. At many of the beaches like Boca Chica, Sosua, and others there are vendors on the beach happy to serve you while you lay there. That can get a bit expensive though. The price of a beer or food is usually 50% to 100% higher than you will pay if you walk up the street a block and buy it at a colmado. So what do you do when you go to the beach in the States? Bring a cooler of course! Due to the hurricane predictions for Tropical Storm Isaac, JetBlue is allowing for a fee waver for passengers that want to make flight changes to and from Punta Cana, Santiago, Santo Domingo, Puerto Plato, and La Romana. Tropical Storm Isaac is expected to have hurricane force winds by the time it reaches the Dominican Republic later today causing delays to flights to Dominican international Airports. Due to the path of Tropical Storm Isaac, American Airlines has already made updates to their Caribbean Travel Policy (see link below) allowing ticket holders to change their flights to and from La Romana, Dominican Republic (LRM), Punta Cana, Dominican Republic (PUJ), Santiago, Dominican Republic (STI) and Santo Domingo, Dominican Republic (SDQ) as well as other destinations in the Caribbean. As per the AA website if your travel date is between August 22-26, 2012 and was issued no later than Aug 22, 2012 you can change your travel date to between Aug 22-26 and the ticket reissue charge will be waved for one ticket change. You can call their 800 number to make the change at 1-800-433-7300. Tropical Storm Isaac is expected to reach Punta Cana Thursday and may have reached hurricane force winds by this time. Punta Cana is at this time at a tropical storm watch with the rest of the northern part of the Dominican Republic while the southern part of the Dominican Republic is at a hurricane warning. The storm is still too far out to know where the center of the storm is going to pass. There is a greater likelihood of Isaac producing hurricane force winds for La Romana, Boca Chica, Santo Domingo and other cities on the .southern coast of the DR.
(8/21/12) Tropical Storm Issac is moving up through the leeward islands on a direct course to Puerto Rico and the Dominican Republic. The storm is expected to pass by Puerto Rico Thursday and start affecting the Dominican Republic Thursday evening to early Friday. As of the 2pm AST report on wed, aug 22 the center of tropical storm Issaac is about to pass over the leeward islands with maximum sustained winds of 45 mph. We’ve started a new post with the updated information on Tropical Storm Isaac once it reached the Dominican Republic. Check Isaac hits the Dominican Republic for the latest information. Isaac is expected to reach hurricane strength as it is passing by Puerto Rico Thursday. There is a Hurricane watch for Puerto Rico, Vieques, culebra and the US and British Virgin Islands. There is also a hurricane watch for the entire southern coast of the Dominican Republic from Isal Saona west to Haiti including La Romana, Boca Chica and Santo Domingo. 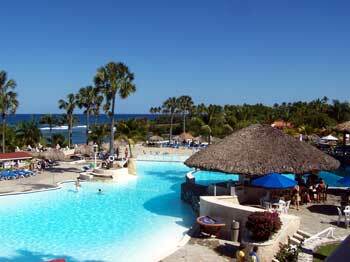 I am finding more and more foreigners that are buying Real Estate in the Dominican Republic. While I favor renting for many reasons, many people are taking advantage of the great Real Estate prices here, coupled with the good conversion rate between the US dollar and the Dominican peso which is currently about 38 pesos to the dollar. Buying Real Estate in the DR poses several risks that are not usually a problem in the US. I’ll be going over many of these as this post progresses. Along with the additional risks there are other things you need to consider. It basically comes down to the necessity of taking your time and investigating the property before you make a purchase. First thing to know is if you only speak English you are very likely to end up paying more for the property than you would if you can speak the local language, Spanish. This is the same whether you are planning on renting or buying a property. Personally I like to look around a bit, than have a Dominican friend come in at a different time and ask the price. He will usually be able to get the same property for at times as little as half the price. There is now another choice on how to get to the Dominican Republic. Frontier Airlines announce it’s new seasonal nonstop flight from Denver International (DEN) to Punta Cana (PUJ) in the DR. The flight started its service on June 9 and will operate each Saturday until August 4, 2012. This flight adds to the current services offered by Frontier to Punta Cana, Dominican Republic, other flights include Baltimore (BWI), Chicago – O’Hare(ORD), Cincinnati, Cleveland (CLE), Philadelphia (PHL), Pittsburgh (PIT) and St. Louis (STL). The flight is set to leave Denver at 8:05am each Saturday and arrive in Punta Cana at 3:30pm. This is good news due to the increasing problems that many of the Dominican Republic airports are having with DR visitors being pulled over and mugged when traveling between airports and their destinations after dark (see Security Alert from US Embassy). The flight leaves Punta Cana (PUJ) at 4:20pm and arrives in Denver, Co at 8:30 pm. The Miami Dolphins will be shooting their 2013 Cheerleader Swimsuit Calendar in Punta Cana this year. The photo shoot will be held from May 30 to June 5 at the Barcelo Bavaro Beach Resort. In addition to the calendar pictures, scenes will be filmed and used for several television specials.